I am very honored to have been asked to be a part of the Cybils team this year. "What are the Cybils?" you may ask. 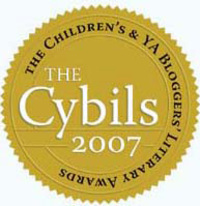 Well, the Cybils are the only literary awards given by bloggers. Last year saw introduction of these awards, which were met with a great deal of enthusiasm by those of us who love children's books and who also blog. I'll be one of the the judges in the category of Fiction Picture books and as the nominations roll in, I'll look forward to seeing which books really spoke to people and why. Of course, I have my own favorites, but I am going to refrain from doing any nominating, so I can bring a fresh and uncluttered take to the process of judging. Please go over to the Cybils blog and read more about these awards and what the organizers want you to think about when you decide which were your favorites of the many books you read and loved this year. Then nominate your picks in each of the categories. Most of all, enjoy being part of the process!